With fresh snow crunching under their boots and a handful of papers to be checked and stamped, truck drivers from Latvia, Sweden and Poland make their way across Norway’s Orje customs station to a small office where their goods will be cleared out of the European Union (EU) and into Norway. 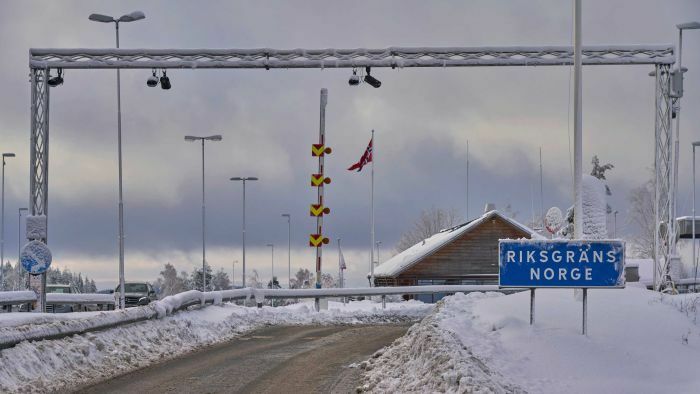 While many border posts in Europe have vanished, Norway’s hard border with the EU is clearly visible, with cameras, licence-plate recognition systems and barriers directing traffic to customs officers. Norway’s membership in the European Economic Area (EEA) grants it access to the EU’s vast common market and most goods are exempt from paying duties, but everything entering the country still must be declared and cleared through customs. Norwegian trials of digitised customs checks have been seized on by some Brexiteers as a way to overcome border-related problems that threaten to scuttle their preferred EU divorce — a concept known as “max fac” in Brexit parlance. But the realities of Norway’s border also shows that technology has not yet been able to facilitate frictionless trade. A divorce deal between Britain and the EU has been stuck on how to manage trade via the United Kingdom’s border between Northern Ireland and the Republic of Ireland after Britain leaves the bloc on March 29. After the Irish War of Independence, the island of Ireland was partitioned in 1921, with the predominantly Protestant north-east staying with the UK as Northern Ireland. This border has served as a flashpoint between Catholic and Protestant communities in Northern Ireland, where some of the former have sought to bring about a united Ireland by force. This conflict, known as the Troubles, unleashed decades of sectarian conflict in Northern Ireland and Britain that cost 3,700 lives ending in 1998 with the Good Friday agreement. The free flow of people and goods across the near-invisible Irish border now underpins both the local economy as well as the island’s ongoing peace. The EU’s proposed solution is for Britain to remain in a customs union with the bloc, eliminating the need for checks until another solution is found. But pro-Brexit British politicians say that would stop the UK from forging new trade deals around the world. At her desk in Orje, chief customs officer Nina Bullock was handling traditional paper border clearance forms when her computer informed her of an incoming truck that used the ‘Express Clearance’ system. “We know the truck number, we know the driver, we know what kinds of goods, we know everything,” she said. So far, only 10 Swedish companies are in the pilot project, representing just a handful of the 400-450 trucks that cross at this border post each day, but if it’s successful the plan will be expanded. In the six months since the trial began, customs official Hakon Krogh said some problems had brought the system to a standstill, from snow blocking the camera, to Wi-Fi issues preventing the border barrier from lifting, to truck drivers who misunderstand which customs lane to use. “It’s a pilot program, so it takes time to make things work smoothly before it can be expanded,” Mr Krogh said. If a driver calls in sick and is replaced by another, or extra cargo is added to a shipment, then all the paperwork can be resubmitted online. But the globalisation of trade means trucks will not just be carrying goods from one country, but from a variety of locations within and outside of the EU. “It’s very easy to deal with a digital system when the goods are uniform,” Norway’s customs section chief, Kristen Hoiberget, said. “If you have one kind of goods in a lorry, it’s less complicated, but if you have a lorry that picks up goods at 10 different places abroad, the complexity arises rapidly. Back in Orje, vehicles entering Norway are randomly checked, with officers mainly looking for alcohol and cigarettes, which are cheaper in Sweden. “If you look 15 years ahead, I guess this office won’t be here. I won’t be sitting here stamping papers,” Ms Bullock said. Border changes are coming, but certainly not in the tight two-month timeframe that any Brexit border changes would need.